While boasting a mighty 3.2-litre, five cylinder engine, Ford’s bulky Ranger may actually benefit from an engine downsize. Lofty Ranger feels big and heavy. However, bulk and low grunt may help to improve towing ability. Pickup buyers have never been so spoilt for choice. And Mercedes’ arrival in the sector, with its own take on a rebodied Nissan Navara, will slam the gauntlet down harder for those seeking a pickup which packs more than four cylinders. Currently, six-pot choice is limited, but Ford still offers the five-cylinder 3.2-litre in its Ranger, alongside a four-cylinder 2.2-litre. Visually, the latest Ranger comes across as a bruiser. Against many of its contemporaries, it does stand head and shoulders above. The bigger motor meets Euro 6 emissions thanks to a whiff of diesel exhaust fluid. Pop the fuel flap open and you will be met with a little blue cap sitting alongside the diesel filler. 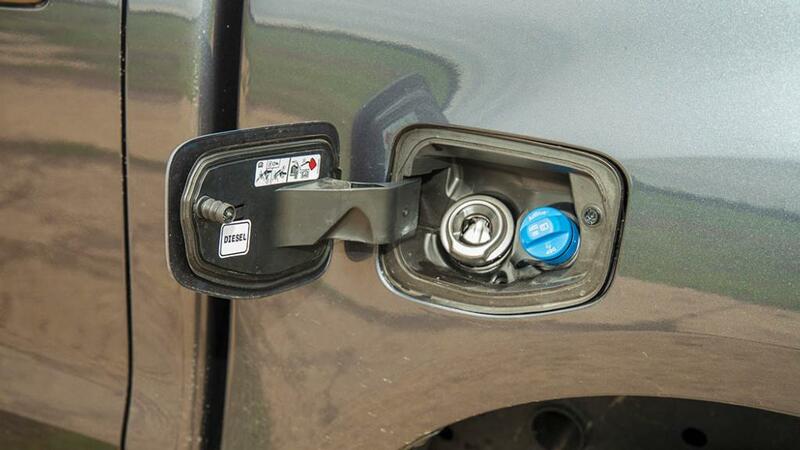 Despite the close proximity of the two fill points, it should be relatively straightforward to keep those correct fluids separated, thanks to Ford’s adoption of its easy fuel capless system. It still packs 200hp, but unlike many others, power delivery is short-lived. By 3,000rpm, you are on a downward spiral of ever diminishing grunt. Load bed can be secured using an optional aluminium roller shutter. There is plenty of available rpm though, and delivery is super-smooth, but accessing it soon becomes a pointless exercise. This is because a 470Nm torque peak arrives at 1,500rpm and hangs around until 2,750rpm. It is a heavy truck too. With almost 2.2 tonnes of kerb weight, what performance it does purport to deliver is somewhat dented by its bulk. So the key to hustling our Wildtrak six-speed manual test model is to shift up early. It does little to help fuel efficiency though, as the Ranger struggles to hit 30mpg. Wildtrak specification is generous, although the orange trim will not suit everyone. But all this gear changing leaves you feeling a little under-whelmed. It is a lot of work for little reward, but could suit those working the big Ranger with a trailer. Wildtrak brings a generous specification and sits at the top of the Ranger line-up. You get 18in machined alloy wheels, sat nav with an 8in TFT touchscreen, rear view camera and logo’d seats. Front parking sensors and a lockable aluminium roller shutter for the load bed are among a few optional extras. Unfortunately, the steering column is only rake adjustable; if you need to change the reach, you will have to slide the seat closer or further away. In this instance, if a Ford Ranger is on your radar, it is easily a scenario where less really is more. We think Ford has not made the most of its bigger engine and we would suggest sacrificing the sweet five-cylinder in favour of the more vocal four-cylinder 2.2. Why? Despite it giving away power on paper, its delivery is much higher up the rev range. Combined with a higher final drive ratio, this makes for a far more relaxing and frugal drive, and is the Ranger we would rather choose. The DEF cap is blue for a reason.